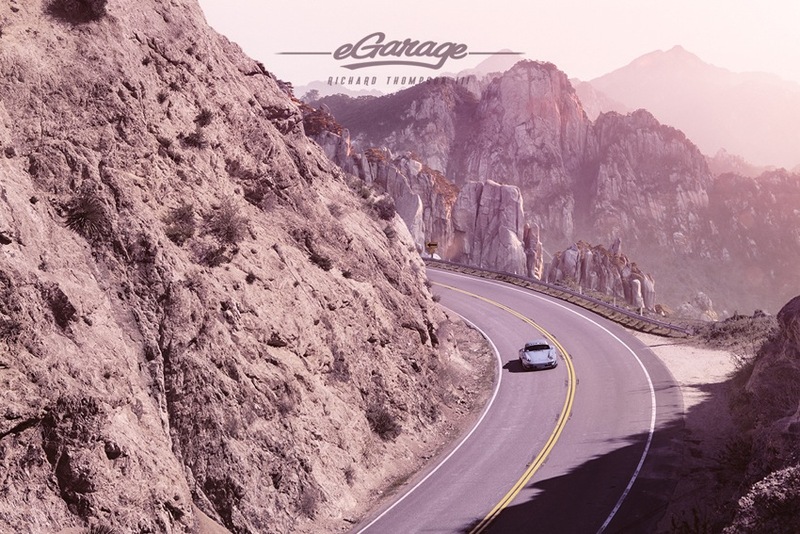 Over the past few years I’ve worked on a handful of projects with Original Automotive Storytellers here at eGarage. Focused as much on the car as they are on the story, they do a great job representing the motivation and momentum leading up to many unique car builds in the Automotive world today. 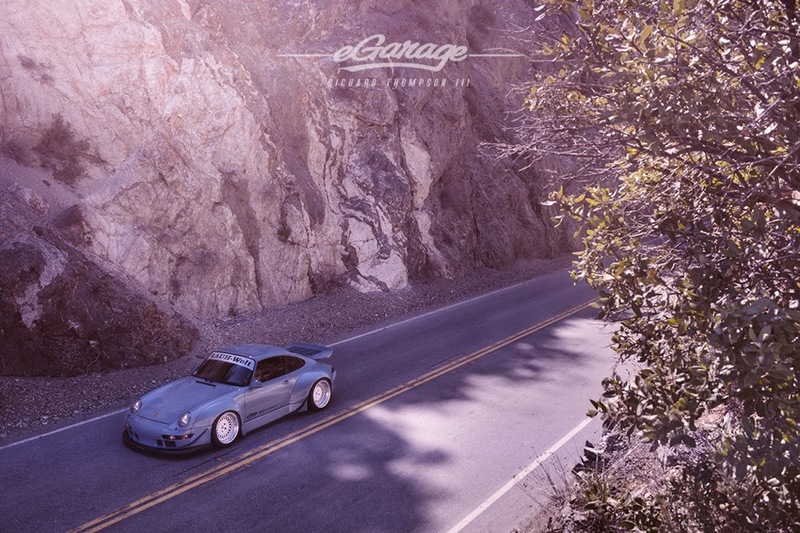 In addition to covering various facets of car culture, they have some impressive machinery themselves, a stable which currently includes a Rauh-Welt Begriff built Porsche 993. For what I imagine to be the less than 5% of the reading audience who aren’t familiar with RWB, a quick visit to Google Images will help. 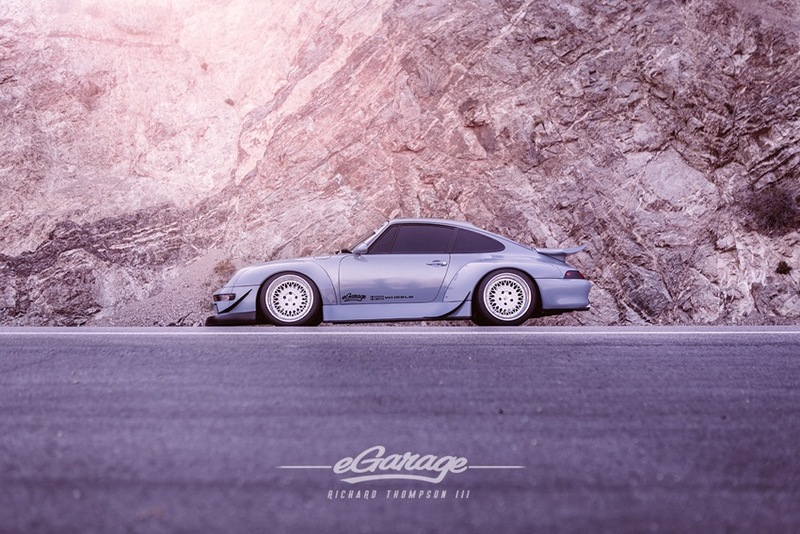 In short: a Japanese tuning firm specializing in modded air-cooled Porsches (mostly 964 and 993). Widebody kits, enormous spoilers, and ground effects so low it’s hard to jam a finger between the front bumper and the asphalt. The first time I laid eyes on an RWB was at Concorso Italiano last summer — the eGarage car, albeit in a different guise. 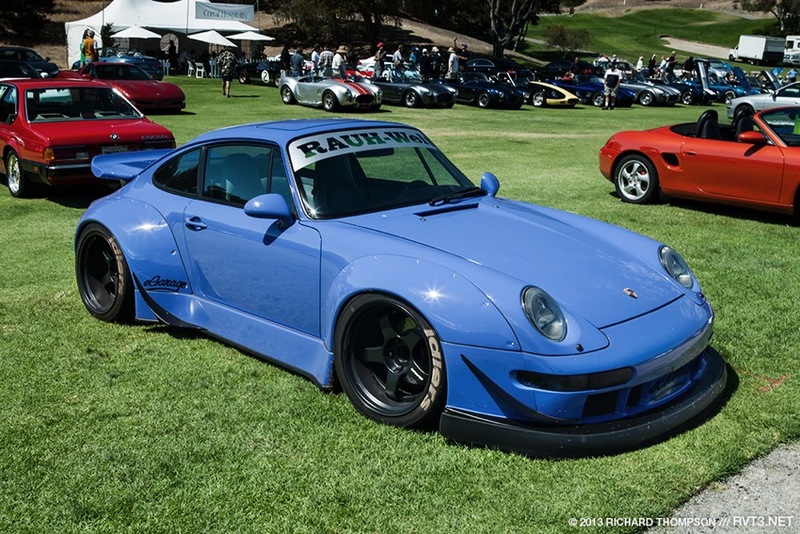 The eGarage RWB at Concorso Italiano, summer 2012. Needless to say when Nic from eGarage called and asked me to do some work with their RWB, I jumped. 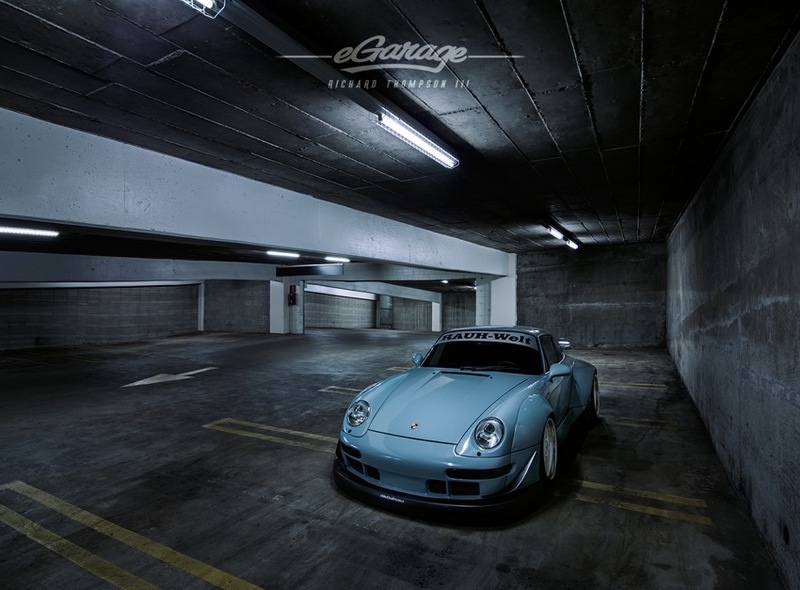 Shortly after acquiring the car from RWB head honcho Akira Nakai, eGarage had it repainted Aviator Gray and outfitted with a set of beautiful HRE 501 Vintage wheels. 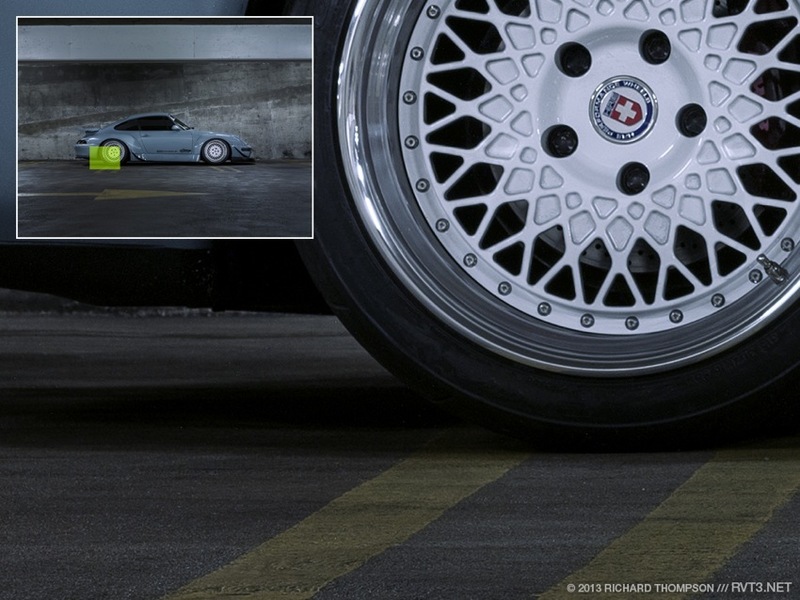 Nic wasn’t going to be around for the shoot, but had the car delivered to me in Los Angeles for the work to be done. From the second it rolled off the transporter it was a clear head turner. At every location people stopped to look, made comments, etc. Downtown a guy nearly fell off his bicycle at an intersection. On a half mile jaunt to a nearby gas station, I discovered the car had been photographed and posted to Instagram twice within five minutes. Even wearing its understated flat gray paint, the signature RWB lines really make the car stand out. Pushing through a downhill sweeper in the RWB. I’d be lying if I didn’t say it wasn’t great to clock some seat time in the 993! Learning the car from a driver’s perspective taught me a bit more about the RWB experience. 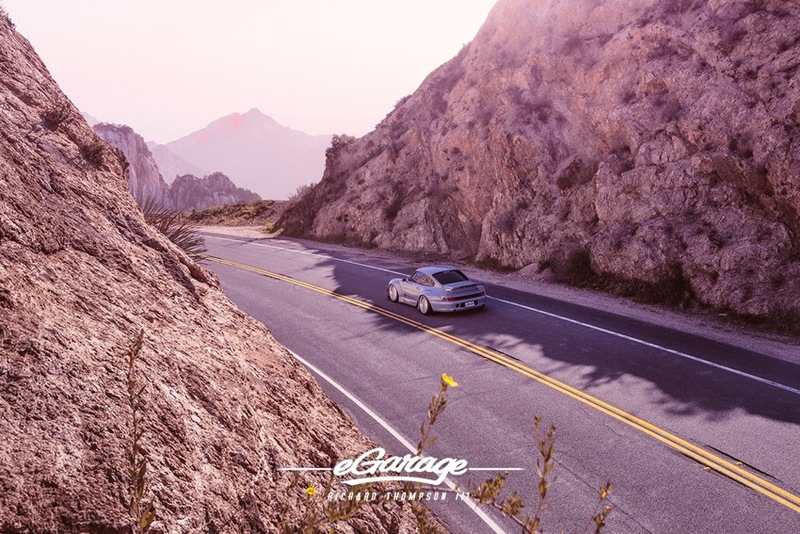 The majority of the shoot was conducted high above LA on Angeles Crest Highway, which proved a great opportunity to stretch her legs a bit. It quickly made its way to the top of my list. The cars I appreciate most are the honest ones — lightweight, neutral: giving a really direct feel of control to the driver via rigid steering and suspension. The RWB certainly checks off some of these boxes, and before I parted ways with the car I came to see it as one of the more entertaining cars I’ve driven to date. This particular 993 (being the non-turbo variety) isn’t blindingly quick, but the outrageously wide footprint and razor sharp suspension were a thrill to drive up the mountains and make the car fast in a different way. Remarkably, the car seems to be in its sweet spot at all speeds and angles. Whether you’re making fast inputs in tight corners or letting the wheel unwind gracefully while powering out of big sweepers, it has a knack for making you want to keep driving. 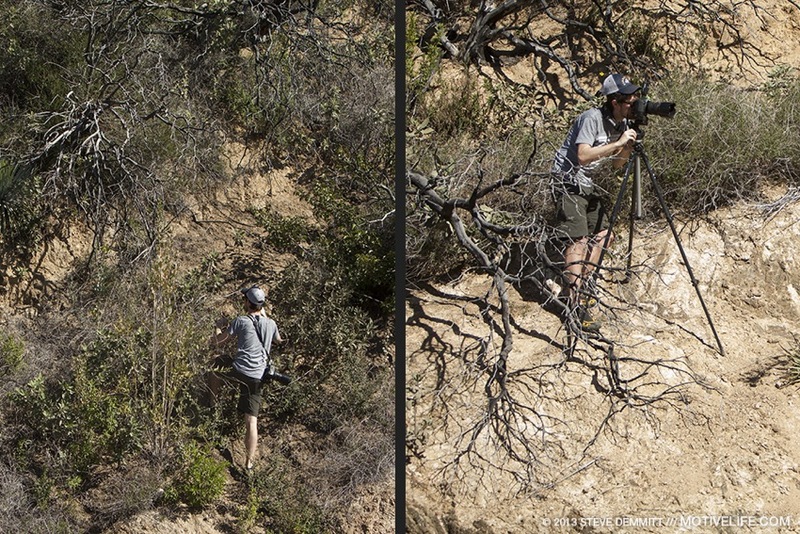 Shooting along Angeles Crest was a lot of fun and wouldn’t have been possible without help from some of my LA car shooting cohorts, Steve Demmitt of MotiveLife and Zach Benge from The Gentleman’s Guide to Racing. Both are rock solid shooters, and it was a treat to have such experienced guys supporting the shoot. We started out with a few tame shots in a parking area to test gear and whatnot, and were joined almost immediately by one of California’s finest who we thought might bust our chops for having such a killer ride. Turns out he was just running a really well positioned speed trap…after scaring a few motorcyclists to death, he took off with a wave and left us to it. 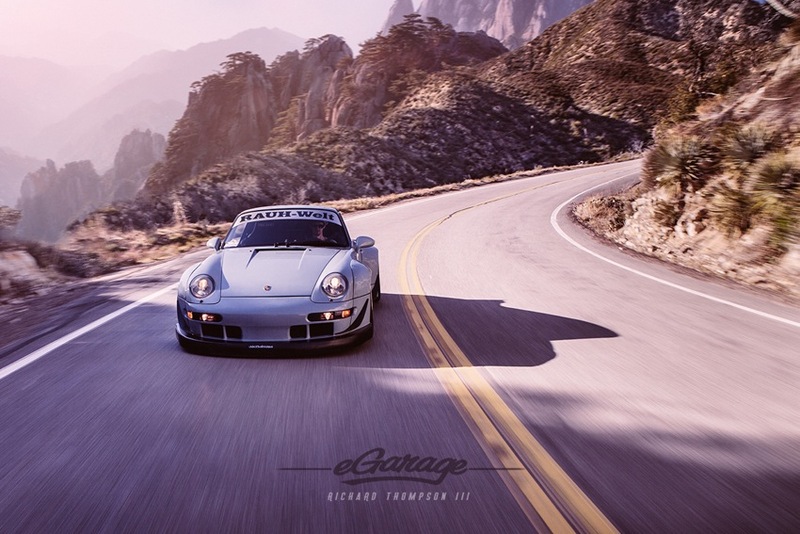 My goal for the shoot in the mountains was to produce some extremely wide, ambient, environmental images which focused less on detail and more on the interaction of the RWB with an epic mountain road. To this end I scouted the road for curves which would allow me to capture the car from higher elevations above the road (mostly accessed by by scrambling up inclines). This was also a great opportunity to form a strong personal bond with the various scratchy plants, bushes, spiders, ants, and snakes which inhabit the area. Yay! To contrast the daytime natural environment photos, I took the car to a gritty, textured parking structure downtown Los Angeles which plays into the “Rough World” moniker. We shot these images with the PhaseOne IQ180 as well as a full set of lenses thanks to my friends at PhaseOne USA. This was a good chance for me to test the Phase system in a low light environment, which I hadn’t done up to this point. It performed surprisingly well and delivered the insane dynamic range Phase systems are known for. I ended up shooting the majority of this sequence using the oddly shaped but hugely impressive Schneider Kreuznach 28mm leaf shutter lens. The IQ180’s 80-megapixel resolution leaves for plenty of room to crop (see below) at more than 10,000 pixels wide, and all the linear energy of the parking garage was too cool to leave out. Front 1/4 angle shows architectural forms working with the car. These images look great with a 16:9 or 2.40:1 crop, but for the sake of this article I left them at the original medium format aspect ratio to illustrate space available for copy. Super wide environmental describing the texture and grit of downtown Los Angeles. Head on, lights powered up and casting subtle reflection.